A 54-year-old woman with past medical history of stage III uterine carcinosarcoma, currently receiving treatment with Keytruda, who presents with new numerous floaters in both eyes for several days as well as flashing lights in the periphery of her right eye. Symptoms began two to three weeks prior, but worsened since. Of note, she was recently hospitalized for fevers and headaches and was diagnosed with aseptic meningitis, but had been discharged the day prior to presentation. Visual acuity is 20/20-2 in the right eye and 20/25+2 in the left eye. Intraocular pressure is 7 and 4, respectively. Anterior segment examination is remarkable for 1+ anterior chamber cell in both eyes. There is trace nuclear sclerosis noted bilaterally. Posterior segment examination is notable for numerous circular white-yellow lesions with a creamy appearance, seemingly deep to the retina in both eyes, though the right appears more affected than the left. No vitritis is noted in either eye. 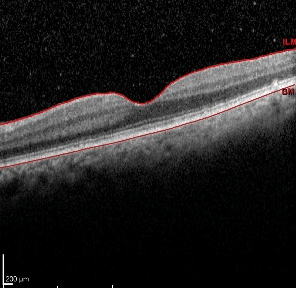 OCT of the macula was normal in both eyes, showing no subretinal fluid or macular edema with normal foveal contours. 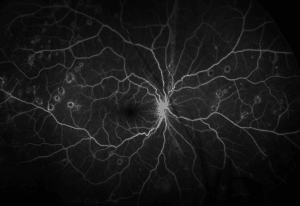 Fluorescein angiography demonstrates numerous foci of hypofluorescence surrounded by a ring of hyperfluorescence, which correlate to the lesions noted above. 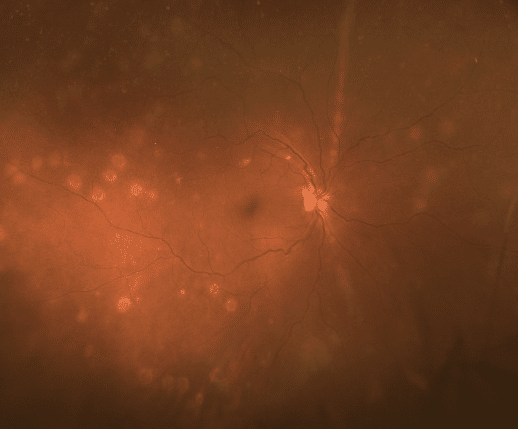 Fundus autofluorescence shows multiple foci of hypoautofluorescence which also correlate with the lesions noted on examination. West Nile Virus is a single-stranded RNA flavivirus which belongs to the Japanese encephalitis virus serocomplex.. It is a zoonotic disease transmitted by mosquito vector. About 20% of infected humans have symptoms of febrile illness, including headache, malaise, and nausea which typically develop 2 to 14 days following infection and resolve after one week. Only 1/150 infected individuals go on to develop meningioencephalitis. The most frequently noted ophthalmic complication of the disease is a multifocal chorioretinitis, which is most often bilateral and present at initial presentation. Other known ophthalmic manifestations include retinal hemorrhages, retinal vasculitis, and optic neuritis. Classically, the posterior pole lesions seen in the context of infection with West Nile Virus are described as round and creamy yellow-white in appearance. They are typically numerous and often are seen to radiate in linear patterns from the optic disc, as was seen in our patient’s right eye. On Fluorescein angiogram, these lesions are typically seen as hypofluorescent spots surrounded by a ring of hyperfluorescence indicative of staining in late phases. The diagnosis in this case was not made only based on fundus appearance, but also on confirmatory laboratory testing. Our patient tested positive for serum IgM to West Nile Virus, which is highly indicative of active or recent infection. Infection with West Nile virus is most often self-limited. There is no universally accepted treatment for West Nile Virus infection so care remains predominantly supportive. Khairallah, Moncef, et al. 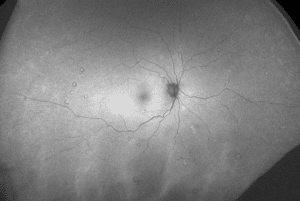 “Chorioretinal involvement in patients with West Nile virus infection.” Ophthalmology111.11 (2004): 2065-2070. Anninger, William V., et al. “West Nile virus-associated optic neuritis and chorioretinitis.” American journal of ophthalmology136.6 (2003): 1183-1185. Chan, Clement K., et al. “Ocular features of West Nile virus infection in North America: a study of 14 eyes.” Ophthalmology113.9 (2006): 1539-1546.